1980 Miracle Bowl: In a battle between the Mormons and Methodists, did the Catholics win? Editor's note: The following is the first of five excerpts from "Hail Mary: The Inside Story of BYU's 1980 Miracle Bowl Comeback" by Ryan E. Tibbitts. The book chronicles the 1980 Holiday Bowl on Dec. 19 between BYU and Southern Methodist University in San Diego. The Cougars trailed 45-25 with less than three minutes left in the fourth quarter, but rallied to win 46-45. The BYU equipment manager at the time of Holiday Bowl III was Floyd Johnson, a great old gentleman, who was the most passionate missionary for BYU and the LDS church that any of the BYU players had ever known. BYU is a private university founded, supported, and guided by the Church of Jesus Christ of Latter-day Saints, and as part of the university mission, sports teams often sponsor “firesides.” These are evening meetings where players speak to small gatherings of church members and interested people in the community. Floyd coordinated the fireside program for the football team and made assignments to various team members to speak to the people who attended these firesides. The theme of these meetings was usually to have several members of the team and coaching staff share faith-promoting experiences about their conversion to/or membership in the church, or to share experiences about how being a football player, getting an education, or providing service to other people contributed to their ability to be a good Christian. Partly because of his assignment to arrange these meetings, Floyd was acutely aware of and constantly in search of opportunities to connect BYU football with the larger mission of the university. While the post-game celebration was reaching a crescendo in the locker room, Floyd blurted out, “If that doesn’t give you a testimony, nothing will!” I knew Floyd well enough to know that he was not really saying that the victory should give someone a testimony of the LDS church or the gospel, he was simply caught up in the rapture of the moment and was trying as best he could to give voice to the unbelievable, unexplainable ending he had just witnessed. Floyd worked his way around the locker room hugging anyone in sight. When he got to me, I said, “I’m not sure what it proves about religion, Floyd; remember, McMahon and Brown are Catholics, Bill Schoepflin (who blocked the punt that gave BYU the ball back with thirteen seconds to play) and Matt Braga (who caught an earlier touchdown to fuel the comeback) are both Catholics too.” I continued, “In the game between the Mormons and the Methodists, the Catholics won!” Floyd smiled politely, mumbled something under his breath, and moved on through the jubilant locker room. My comment about the Mormons, Methodists, and Catholics seemed catchy to me, so I filed it away in my memory and used it many times over the next weeks and months (and even years), when anyone tried to explain the BYU bowl victory as some kind of divine intervention. I could usually get some good laughs at firesides or other speaking engagements with that story. A year later I was in my first year of law school at BYU and was still occasionally asked to speak at firesides or other functions about the game and my experiences as a member of that BYU football team. At that time it was an annual tradition at the law school to invite the head football and basketball coaches to speak at “brown bag” luncheons during their respective seasons. Law students and faculty would fill up the moot court room and listen to the coaches talk about their respective sports as a break from briefing cases and worrying about all-or-nothing final exams. Head football Coach LaVell Edwards was always a popular draw for the luncheon series. He was and is a witty and compelling speaker and has always enjoyed the back and forth with the law students in a question-and-answer session—usually with his tongue firmly planted in his cheek. For example, at the time of Holiday Bowl III, Coach Edwards was regularly taken to task in the press and by fans because he avoided trickery on the field, such as fake punts, reverses, and other so-called “trick” plays. When he opened the brown bag session up to questions, one law student, no doubt trying to sound impressive to the crowd, queried, “Coach, do you have an aversion to deception or why don’t you ever run trick plays?” Without much hesitation, and feigning deep contemplation, Coach Edwards replied, “I guess you could say I have an aversion to deception— which is why I never considered becoming a lawyer.” Of course, most everyone laughed hysterically, and that exchange extinguished any further questions designed to put coach on the spot. Because I had been on his team for a couple of years, the law school organizers of the luncheon asked me to introduce Coach Edwards to the crowd. I proudly complied with the request. In the process of the introduction, I told my, by then, well-worn story that in the battle between the Mormons and Methodists, the Catholics had won. I was flattered by the laughter I received from the crowd of law students and faculty. As a lowly first year law student, I was really trying to impress them. When Coach Edwards took the microphone, he quickly clarified, “Wait a minute, Ryan. Remember, the Catholics only tied the game. It took a returned LDS missionary, Kurt Gunther, to actually win the game for us!” The moot court room exploded with laughter. In one stroke, Coach Edwards had trumped my Mormons, Methodists, and Catholics joke. I knew full well, of course, that there were many LDS players on both sides of the ball for BYU whose efforts were crucial to our victory that night in San Diego. Running back Scott Phillips scored fourteen points with two touchdowns and a two-point conversion. Phillips also caught ten passes, which set a Holiday Bowl record, and he was really a workhorse for the team out of the backfield throughout the game. In one important play that is often overlooked, on the second BYU play from scrimmage in the game, Jim McMahon attempted a pass down the field. SMU nose tackle Michael Carter blocked the pass, which flipped up in the air. SMU linebacker Byron Hunt was right under the ball and would have intercepted it, but Phillips had the presence of mind to get a hand on the ball and knock it away just as it settled into Hunt’s hands. As bad as the first half was for BYU, an interception on the second play of the game, deep in BYU territory, would have likely led to an even worse disaster. Vai Sikahema, a freshman running back and kick-return specialist, scored on an 83-yard punt return just before the half to breathe some life into the moribund Cougars. Corey Pace was the long snapper for the game-winning extra point. Many players on the starting offensive line were LDS, including center Bart Oates and guards Lloyd Eldredge and Calvin Close—all three of whom had served two-year proselyting missions for the Church of Jesus Christ of Latter-day Saints. Tackles Nick Eyre and Ray Linford were LDS, as was middle linebacker Kyle Whittingham, who had a game high ten unassisted tackles. Glen Redd, Glen Titensor, and Mark Brady, who were also standouts on defense, were LDS, as were many others. Freshman kicker Lee Johnson pulled off a clutch on-side kick, which was critical in the comeback too. Yet, I had chosen not to let those facts get in the way of a good joke. It is an interesting contrast between the BYU teams from that era and today that on the starting offensive and defensive units for BYU in 1980 there were only four returned LDS missionaries: Eldredge, Close, and Oates on the offensive line and Brad Anae on the defensive line. None of the so-called skilled position starters (quarterbacks, receivers, backs, defensive backs) on the 1980 team were returned missionaries. There were several returned missionaries on the special teams, including Corey Pace and Kurt Gunther. For many years, it was considered a weakness for BYU to allow its players to serve two-year missions, as it was thought they would lose their edge, be too out of shape to play, or otherwise lose the desire to play the physical game of football. Those things are all factors for some players, but for others the two years away from the sport allows them to grow and develop more, possibly improving their game. As more and more BYU players began to serve missions and then come back and succeed on the football field, BYU was often accused of using the mission program to enhance the football program. Ultimately, because a mission can be a plus and a minus as far as football is concerned, the theory that BYU supported the LDS mission program only as a way to gain a competitive advantage in football was proved to be a fallacy. These days many universities around the country have returned missionaries on their rosters in various sports. That eighteen-month-to two-year-mission hiatus is now just considered a fact of life when recruiting many LDS athletes. In 2000 BYU held a twenty-year reunion for the 1980 Miracle Bowl squad. The university hosted the team for a nice dinner and invited team members to accept applause on the stage of the BYU Homecoming Spectacular in the Marriott Center. Later we were escorted onto the field at halftime of the homecoming game to watch highlights of the 1980 Holiday Bowl on the big screen and receive another ovation. It was a wonderful experience for us—even if it was shocking to see how old, bald, and paunchy many of us had become. During the various festivities, I had the chance to talk to my old teammates and catch up on everyone’s lives since our days wearing the royal blue uniforms. When I talked to Kurt Gunther, I told him about my experience at the law school luncheon years before with Coach Edwards. He laughed and said, “I know. Every time I see Coach he tells me that story with a gleam in his eye.” Kurt and I were on the BYU JV football team during the 1979 season, and I had been his holder for PATs and field goals, so we had bonded over those experiences before Kurt became the varsity place-kicker. We had a good laugh at those memories. Every year during the spring football practice schedule, the football coaches and athletic department hold a barbeque and reception for former players and their families. They invite us to a closed scrimmage and encourage us to get back in touch with our BYU football roots. In 2011 I realized I had not attended the spring festivities for several years. I happened to have a free date on my schedule, so I took my family to the barbeque and scrimmage. One of the former players I met on the sidelines during the scrimmage was Kurt Gunther. Kurt and I again reminisced and had some laughs about our football days at BYU. As often happens, the talk turned to the 1980 Holiday Bowl. I reminded him of my ill-fated Mormons, Methodists, and Catholics joke, and we laughed again at the story of how Coach Edwards had one-upped me at the law school luncheon. Kurt then told me a few things about his game-winning kick in 1980 that I had not heard before. Among other things (as I will explain later) he was focused on keeping his eye on the ball. He knew that if he took his eyes off the ball—one of the most common mistakes in many sports, including golf, tennis, baseball, soccer, and American football—he would likely not succeed in the attempt. The pressure on him had been intense. I was surprised to learn that in addition to the pressure of the moment and just closing out the win in the miraculous comeback, several other problems presented themselves as Kurt took the field and attempted that game-winning kick. The television announcer of the 1980 Holiday Bowl game for the Mizlou Network, famed sportscaster Ray Scott, probably had no idea how true his observation was shortly after the final McMahon-to-Brown touchdown. He said: “The pressure is now all on this BYU special team.” If he’d only known what was really going on in Gunther’s head at the time, Scott may have dwelt on that point even longer. True, there was pressure all along the BYU line—for the long-snapper, Corey Pace, and the holder, Bill Schoepflin. But the full weight of that tension fell squarely on the shoulders of 5'10" 170 pound Kurt Gunther as he ran on the field in his size-seven soccer shoes. 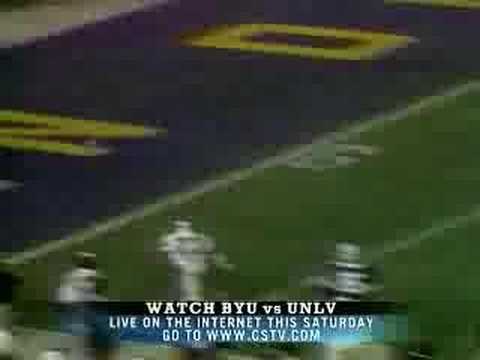 Much has been written about the heroics of McMahon and Brown in tying the game with no time on the clock, about Sikahema’s punt return for a touchdown, about Braga’s diving touchdown reception, and about Schoepflin blocking the punt that gave BYU the ball in scoring position with thirteen seconds to play. Each of those plays was spectacular in its own right. Not as much has been written or said about the mini-drama that was playing out in Gunther’s head as he took to the field to kick an extra point that would ensure that everything that preceded it would not be obscured by a tie. As he joined the final huddle that night, with the score tied 45 to 45, with no time on the clock, after one of the most dramatic comebacks in college football history—certainly the most dramatic comeback in BYU football history—in a televised post-season bowl game, Kurt was not thinking of glory or victory. He told me he was thinking about the place-kicker for BYU the year before and the ending of the prior year’s Holiday Bowl. I was stunned at what he told me. I simply could not believe it and said something along the lines of, “You’re kidding me, right? That is what you were thinking about? Are you serious?” He assured me he was. After hearing him describe the details of what was going on in his head, I’m a little surprised he was willing to take the field at all. "Hail Mary: The Inside Story of BYU's 1980 Miracle Bowl Comeback" is available at Deseret Book, Barnes & Noble, Seagull Books, Dolly's Bookstore and BooksAndThings.com and Amazon.com. Ryan E. Tibbitts will be signing his book at Dolly's Bookstore (510 Main Street, Park City) on Saturday from 1 p.m. to 3 p.m.